Armed men attacked a convoy of cars carrying the US envoy to Bangladesh in the capital Dhaka on Saturday night, US officials said. Ambassador Marcia Bernicat and her security team were able to get away unharmed, but two cars were damaged. [post_ads]It comes as thousands of students and school children continue a week-long protest calling for safer roads. Police used tear gas to disperse crowds on Sunday. At least 50 protesters have also been injured in street attacks. Local media reported that political activists belonging to the governing party beat students marching towards their offices. The students were demanding to know why protesters were attacked on Saturday, in clashes which left dozens injured. The US ambassador condemned the violence. "Nothing can justify the brutal attacks and violence over the weekend against the thousands of young people who have been peacefully exercising their democratic rights," a statement on the embassy's Facebook page said. "The peaceful demonstrations of the past week in favour of better vehicle and road safety, led by students and school children across Bangladesh, have united and captured the imagination of the whole country." How has the governing party responded? Obaidul Quader, general secretary of the Awami League, told journalists that party activists acted in self-defence as the students attacked first. "Will we kiss them if they advance towards Awami League office?" he said. Government officials have called for an end to the protests. Prime Minister Sheikh Hasina urged protesters to stay at home. "Whatever they have done is enough," she said, adding that police had begun a week-long campaign to bring discipline to the roads. 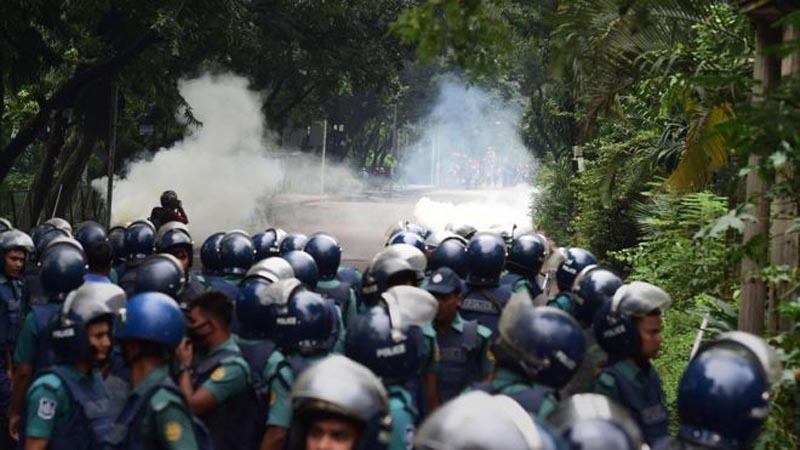 Meanwhile Home Minister Asaduzzaman Khan warned that the patience of law enforcement officers with the protesters was wearing thin. "Even we have a limit. We will take action if that limit is exceeded," he said. Young people took to the streets peacefully after a boy and girl were killed by a speeding bus last Sunday, despite repeated calls from the government for them to return home. Over the past two days, unidentified men in helmets carrying sticks and metal rods have attacked protesters and journalists. Local media have blamed groups linked to the Awami League. Witnesses have told the BBC that anyone found filming the clashes, including journalists, have been beaten and had their equipment destroyed. The government blocked 3G and 4G internet services for 24 hours on Saturday evening in response to the protests, with young people complaining that this is to stop them organising and sharing their actions. Protesters, some as young as 13, have been stopping traffic on Dhaka's notoriously clogged streets to check vehicles and drivers have valid documents before letting them drive on.